Pokémon: Let's Go, Pikachu! and Pokémon: Let's Go, Eevee! bring the experience of a classic Pokémon RPG to Nintendo Switch with gameplay that is easily approachable for newcomers to the series, but is also deep enough to keep veteran Trainers on their toes. The games also have two-player simultaneous play, so you can take the journey with a friend! And there’s a deep connection between Pokémon: Let's Go, Pikachu! and Pokémon: Let's Go, Eevee! and Pokémon GO, so fans of the hit mobile game will find even more to enjoy. Pokemon: Let's Go, Pikachu! was released on Switch 155d ago in the US and the UK. Notify me when Pokemon: Let's Go, Pikachu! is available. Based on 1 Pokemon: Let's Go, Pikachu! 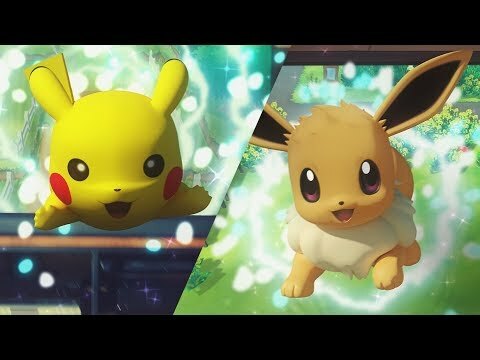 review, Pokemon: Let's Go, Pikachu! gets an average review score of 83. Powerful friends and new mechanics make for a delightful return to the Kanto region in Pokemon: Let's Go, Pikachu and Eevee.